The best place from which to admire the grounds at Belhaven House is from the first-floor orangery overlooking the garden to the rear of the house. This elevated position affords a bird’s eye view down the formal, terraced garden backed with a traditional East Lothian red sandstone wall smothered with honeysuckle, clematis, roses and Chaenomeles speciosa nivalis – flowering quince. Here, height comes from the avenue of metal arches, covered in pale pink Rosa New Dawn and underplanted Maytime, Caravelle and Alibi tulips and burgundy coloured wallflowers, that span the central flagstone path. Below the wall is the generous herbaceous border punctuated with box balls and topiary bay trees. On the far side of the path a curved lawn is backed by informal plantings of trees and shrubs. Roz Bruneau, who, with her husband Jon moved here 16 years ago when their eldest child was just nine months old, explains: “We built the conservatory because we felt separated from the garden and wanted to interact with it.” Now they can look into the garden all year round: planning planting schemes in the winter, and enjoying the tulips in spring and the abundant herbaceous border in the summer. Built in 1799, the Georgian house, adjacent to Belhaven Hill School in Dunbar but not a part of it, was acquired by the Stanley Smith Horticultural Trust in 1970. When Sir George Taylor, the Edinburgh-born botanist, horticulturalist and director of Kew Gardens from 1956, retired, he was given Belhaven House as a lifetime legacy. 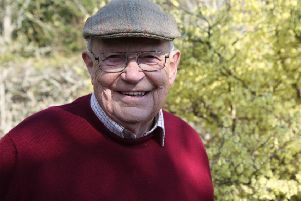 Taylor, who studied botany at the Royal Botanic Garden Edinburgh, where he developed a love of gardening, believed that plants were best understood when seen in their native habitat. Travelling widely he collected samples including the handkerchief tree, Davidia involucrata, which still grows in the woodland garden, and the strawberry tree, Arbutus unedo, in the drive. Bought by Rebecca and Mark Tyndall in the 1990s, the garden in its current form owes much to Rebecca’s design skills and plant knowledge. Roz explains: “When we viewed the house, Rebecca left us on the terrace with a glass of wine to think about things. She also told us not to worry about the garden, that we could come back to it in a few years’ time.” Rebecca went on to create a magnificent garden at Bowerhouse, Dunbar. Despite busy lives Roz and Jon found they could not leave the garden, and although Roz admits to having been “overwhelmed to the point of wondering if we would ever have time to have more children” – they now have three – they “launched” themselves in, weeding and raking up leaves and enlisting family help. Roz even fertilised the peach trees in the walled vegetable garden by hand with a paint brush. They soon learned that despite its location close to the sea the garden is relatively sheltered and the soil is free draining. Rebecca Tyndall’s legacy is perhaps most keenly felt in the creation of several herbaceous borders, the most notable of which is in the old formal rose garden, and the establishment of a seating area and avenue that passes through the centre splitting both borders down to the children’s garden. Rebecca also designed the classical box-edged beds in the kitchen garden. Here Roz and Jon have added a richly planted peony border, herb border, cutting beds, soft fruit cage and a square devoted to vegetables. Back in the main terraced garden, the couple explain that the sitting area in the main border is sited to take advantage of the last of the summer sun. Wander up the flight of stone steps that lead though an opening in the wall and you come into the sloping woodland garden. Here, at the top of the hill, a grey-blue summer house offers views over the Bass Rock and a quirky pair of metal chairs emerge from a bed of fresh young grass and cow parsley. “One of the things I love about this garden is that there are pockets that are still wild,” says Roz. It has also proved the perfect habitat and haven for hedgehogs. A tour finishes in the front garden, where the drive takes you past the Lodge designed by Sir Robert Lorimer, now Jon’s mother’s home, to the classical box parterre on both sides of the front door. Beyond, the path leads past a pair of rusty metal cockerels, the first of a small collection of contemporary sculptures that punctuate the garden. “This is very much a classical garden,” Roz explains, “and we wanted to introduce items of contemporary sculpture to lighten it up.” Others include a plaster horse’s head and a shiny metal spiral that captures sunlight in the main border. All are typical of the flair the couple bring to this garden.